The latest Chrome release doesn't offer a ton of new features for PC users, but there's a new-ish extension for compressing your data usage. Google released the first major Chrome update of 2016 on Wednesday, featuring the official roll-out of a data-saving extension for PCs. The search giant also added a new way to manage extensions that sounds like a nightmare for anyone using more than 10. For PC users, the most interesting part of the Chrome 48 release is the announcement that Google's Data Saver extension is exiting beta. 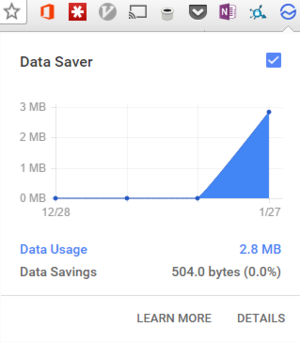 Data Saver uses the same compression technology as Chrome for Android. It's a tool for reducing bandwidth usage for anyone who frequently uses a shared or metered connection. We took a look at Data Saver last March when it first came out. At its core, the extension remains pretty much the same. Once you install it, Data Saver immediately begins compressing data and reducing your bandwidth usage. Click on the extension's icon to the right of the address bar, and a simple graph shows how much you've saved. There's also a checkbox to turn off the extension. The interface is far more refined compared to the last time we looked at Data Saver. The graph is more detailed and easier to read, the data usage and savings numbers are clearer, and there's a details page to see which sites are using the most data. 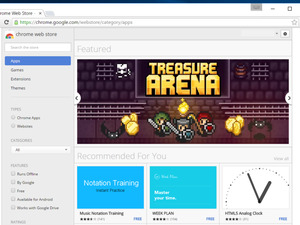 Chrome 48 is also adding a new way to manage your extensions. Starting with this version of the browser and going forward, Chrome will show all extensions to the right of the address bar. Google says it's doing this to make it easier for users to see everything that's installed, and thus query or remove anything they don't recognize. The impact on you at home: Anyone like me whose extension count rises into the double digits will likely be in for a shock when they update to the new version of Chrome. Currently, Chrome only has space for about seven extensions in that space, which is less than half of what I have installed. For extension addicts like me, having all those little icons in one spot will be overwhelming. For users who don't go as crazy with extension installs, this will be a helpful addition.